Denes Tranquil+ Powder is a traditional herbal food supplement for times of nervousness, shyness, over-excitement, hysteria and anxiety. 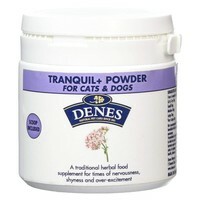 Gentle in its action, Denes Tranquil Powder has been developed with a combination of herbs that fall into a category known as nervines. Some of these are tonics, which strengthen the nervous system, while others have relaxing properties and will reduce levels of anxiety and excitability.